USGS: Okla. At Increased Risk Of 'Damaging Quake' : The Two-Way The U.S. Geological Survey and its state counterpart issued a joint statement saying magnitude-3.0 temblors had increased by 50 percent since October. 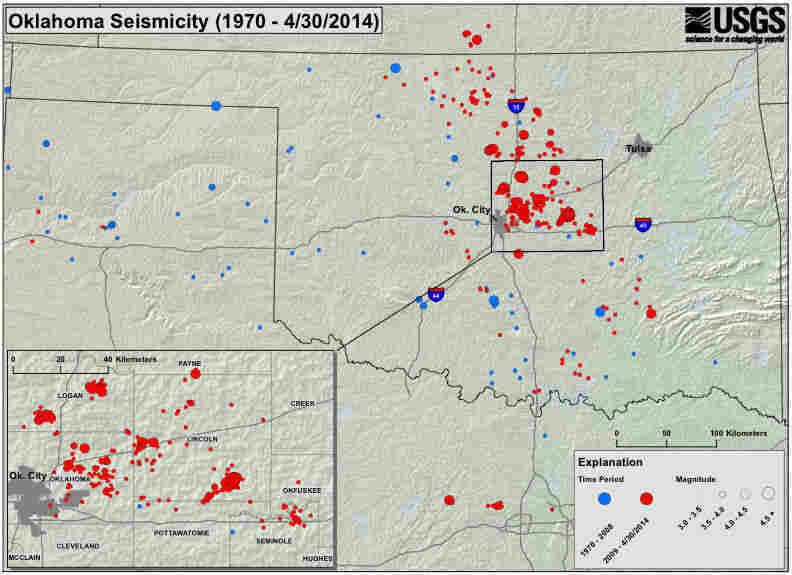 A map showing seismic activity in Oklahoma since 1970. The U.S. Geological Survey says the number of earthquakes in Oklahoma has gone up dramatically in recent months and that the surge in seismic activity has increased the danger of a damaging quake in the central part of the state. The USGS and Oklahoma Geological Survey issued a joint statement on Friday, citing a dramatic spike in magnitude-3.0 temblors, especially since October 2013. The agencies said "183 earthquakes of magnitude 3.0 or greater occurred in Okla. from October 2013 through April 14, 2014. This compares with a long-term average from 1978 to 2008 of only two magnitude 3.0 or larger earthquakes per year. As a result of the increased number of small and moderate shocks, the likelihood of future, damaging earthquakes has increased for central and north-central Oklahoma." "We hope that this new advisory of increased hazard will become a crucial consideration in earthquake preparedness for residents, schools and businesses in the central Oklahoma area," said Bill Leith, USGS senior science adviser for earthquakes and geologic hazards. "Building owners and government officials should have a special concern for older, unreinforced brick structures, which are vulnerable to serious damage during sufficient shaking." The statement says "a likely contributing factor to the increase in earthquakes is wastewater disposal by injection into deep geologic formations." "The water injection can increase underground pressures, lubricate faults and cause earthquakes — a process known as injection-induced seismicity," according to the statement. "Much of this wastewater is a byproduct of oil and gas production and is routinely disposed of by injection into wells specifically designed and approved for this purpose. The recent earthquake rate changes are not due to typical, random fluctuations in natural seismicity rates," it said. In October, USGS issued a similar, though slightly less ominous statement that said the earthquake risk had increased tenfold and that there was some evidence of it being linked to hydraulic fracturing, or fracking. A previous version of this story incorrectly said that the United States Geological Survey had linked an increase in seismic activity in Oklahoma to fracking.